Have you ever wondered what snacks exist in other countries? Well, Snack Girl is on the case! Back in May, my FIRST press interview came from (guess where?) Russia! A Russian health website featured Snack Girl (Cheeseburger Post) and then I took the opportunity to interview the reporter who contacted me. Xenia, editor of the health website, lives in Moscow. I asked her about the snack habits of Russians. She told me that Russia has fast food venues that serve healthy national dishes such as kasha (buckwheat) and borscht! Can you imagine being served a whole grain dish and a vegetable soup at McDonald's? This is a really simple soup to make and it only has 100 calories per serving before you add the sour cream. 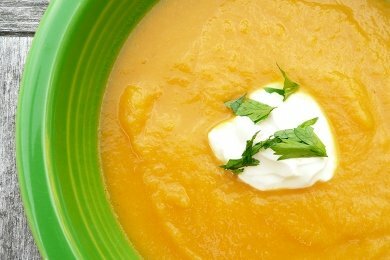 The highest calorie sour cream is 30 calories per tablespoon and you only need a little bit to make this soup POP. I recommend using the sour cream to add flavor and a little more protein (especially if you are hungry). Plain this soup is good, with sour cream this soup is delicious. You can use carrots for this soup as well. I used a carrot because I didn't have enough beets and that is probably why the soup is orange instead of pink. 1. Peel and cut beets into 1 inch chunks. Coarsely chop onion. 2. Heat a large dutch oven or pot over medium heat. Add oil and onion and cook, stirring occasionally, until softened, 5 to 7 minutes. 3. Add beets, broth, and 3-4 cups water (enough to cover) to the pot. Bring to a boil, reduce to a simmer. Simmer until beets are tender, about 30 minutes. 4. Using a blender, puree soup until desired consistency. Remember not to fill the blender past half way. You will have to puree in batches. Add salt and pepper to taste. 5. Add dollop of sour cream and parsley and enjoy! Please share your ethnic snack ideas! Having grown up in a Ukrainian family, borscht was a common soup in our house. It is so delicious and I'm always surprised at how many people turn up their noses to this. But once they try it they are pleasantly surprised. You should think about an immersion blender. 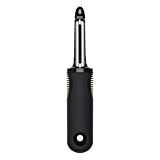 I have one i use for all soups and sauces, way less work and mess. Love beets, have Russian grandparents but I've never had or made borchst. I'm inspired. I wonder if you can use the pre-cooked (Melissas) beets? Also think maybe low sodium broth could work. Thanks for the idea, did you eat hot or cold? @Claire - I tried the immersion blender on this one - and it didn't work - maybe my chunks of beets were too large. 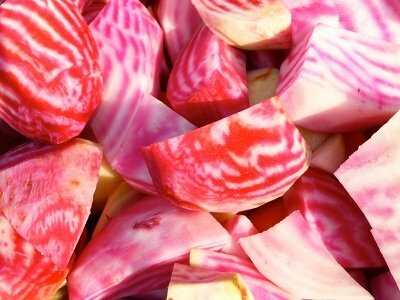 @Lauren You could use precooked beets - (and it wouldn't take very long to cook) but it might be $$ vs. raw beets. Low sodium would also work - and I ate it hot - but you could also eat it cold. This soup is very versatile. I have started using plain greek yogurt in place of sour cream. The fat free stuff has a serving size of one cup and that one cup has about the same number of calories as two tblsps of sour cream. So one dollop of greek yogurt should be good enough!!! Plus, there is the extra tang from the yogurt and the extra boost of protein! instead of peeling the beets raw, you could cook them in hot water till their skins are tender (minutes), cool them aand slide the skins off. the water you cooked them in could be used in the recipe. sounds like a great soup! wil have to try it! thanks! Have you tried to add some low fat cheese cubes? I make a BIG batch of soup for the week, and when I microwave it, add some cubes and they feel yummy. I just loved this soup, I had it back a couple of years ago. One helpfull tip, instead of peeling the beets raw, place them whole (skin and all) and cook them with steam ("a vapor" we say in spanish) for about 10-15 minutes. They dont have to be cooked all the way, just soft enough to peel them by hand, but you can leave them for 25-30 minutes and have them completly cooked. Using steam keeps most of the vitamins and minerals that are washed of when cooked in water. Tip #2 - use gloves to peel them by hand or you will end up with pinkish hands lol. Yum, beets! I bought a bunch of red and a bunch of golden yesterday. Maybe I ought to make this! This sounds Yummy! Gonna have to give it a try! Borsch is Ukrainian and there is no "t". Do you know the WW points plus for this?